This is an amazing record. "Dream To Make Believe" is the debut recording for AFS, a youthful New Jersey-based foursome of talented musicians with transcendental ideas interwoven into a stormy dissonance offset by sheltered melodic runs bathed in warmth. It's explosive while easy going, stepping away from the glut of personal affectation into the world of wonderment with the body at rest. 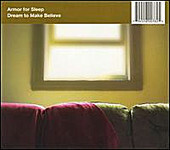 Theirs is an introspective look at life in still water where the metaphysical and spiritual merge to create sonic soundscapes both fluid and jarring, catchy, shy and altogether appealing to listeners of Emo-Rock, Power Pop, and sensual slow moments, lullaby-like in their method, easing the listener into subconsciousness and subsequent search for reason. Set apart by a thematic step away from reality's chill for the sanctity of sleep and eventual freedom, they combine edgy and quick minor chording technique accentuated by mild harmonic runs, lingering resonance, and Ben Jorgensen's thoughtful croon. Think in terms of Alkaline Trio, Senses Fail and the combined effects of both with Further Seems Forever for a modern sounding record lent to middle of the night melodrama and embryonic escapism. After the short and subtle lyricless opener sets the tone, feelings of darkness, hope, despair and longing pervade the welcoming senses drifting back to a time of innocence and desire. Astonishingly clever and clear for the band's debut, though not without its occasional bout with the mundane after an amazing run through an optimistic early going headed by "Dream To Make Believe," "All Warm," and "The Wanderers Guild." After stepping lightly through tracks 7-9, we're met with the omnipresent feel of the lamentable "Kind Of Perfect," before concluding with the starry eyed search for reason "Slip Like Space."